Well those new gTLD domains are starting to rollout and I can’t wait to see how creative people are use them. 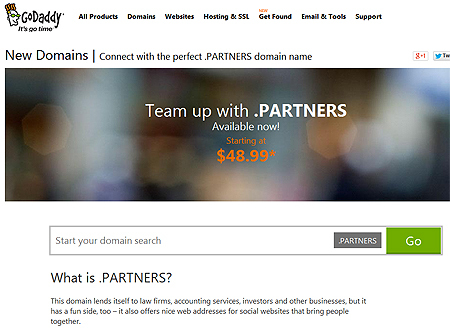 While being promoted for business entities that are actual partnerships, as are common in the legal, accounting, medical, consulting, real estate and investing fields, there are no pre-qualification requirements on the .partners domain. Will .partners be more popular than .firm? So what will human partners do with it? What will school friend buddies do with it? What about temporary teams or marketing partners do with it? If you hear of any interesting ones, please let us know. ‹ What The F*** would I do with a .wtf domain name?